A rising star of the music world is bringing his band to the Derbyshire town where he spent a summer helping to build glamping cabins and attending folk sessions in pubs. Jack Badcock, singer and guitarist with Dallahan, reached the final of the BBC Young Traditional Musician Of The Year Award 2014. He will be performing with his band at Wirksworth Town Hall on Friday, October 2. Dallahan’s arrangements of original music and traditional Irish tunes and songs have secured their presence at such prestigious international events as Milwaukee Irish Festival in the USA, Copenhagen Irish Festival and Celtic Connections to name a few. As individuals, band members have earned various awards. Accordion player Paddy Callaghan won the BBC Young Musician Of The Year Award 2013, Ciaran Ryan won the title of All Britain Banjo Champion 2006 and fiddle player Jani Lang won first prize at the inaugural Hungarian Traditional Music Competition. As a band, they received an Emerging Excellence Award from Help Musicians UK and were nominated for Best Up and Coming Artist of the Year and Album of the Year at the Scots Trad Music Awards 2014 and 2015 respectively. 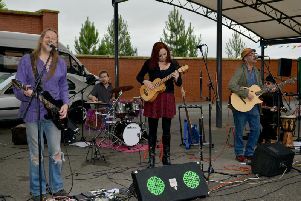 Dallahan will be supported by musician Robyn Wallis Johnson (from the Nelson Arms in Middleton) at their gig in Wirksworth at 8pm.